Size of the INDUSTRY Indian Construction Industry consists of 200 firms in the corporate sector. In addition to these firms, there are about 1, 20,000 class A contractors registered with various government construction bodies. 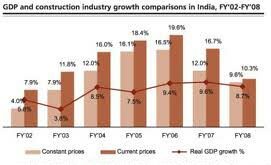 Output per annum The Indian construction industry has been playing a vital role in overall economic development of the country, growing at over 20% Compound Annual Growth Rate over the past 5 years and contributing ~8% to GDP. Percentage in world market Total sales of construction industry have reached Rs. 42885.38 crores in 2004 05 from Rs. 21451.9 crores in 2000-01. Indian Construction Industry is highly fragmented. There are mostly unorganised players in the industry which work on the subcontracting basis. As the Construction activity being labour intensive, construction companies have been mainly focusing on mechanization over past few years. Consequently, growth in quantum of labourers required has declined from 1.6% in FY 04 to 0.9% in FY 08. Projects in Construction industry are mostly working capital intensive. For the first five-year plan, construction of civil works was allotted nearly 50 % of the total capital outlay. In 1954 National Industrial Development Corporation (NIDC), was set up in the public sector which is the first professional consultancy company. Then later many architectural, design engineering and construction companies were set up in the public sector (Indian Railways Construction Limited (IRCON), National Buildings Construction Corporation (NBCC), Rail India Transportation and Engineering Services (RITES), Engineers India Limited (EIL), etc. and private sector (M N Dastur and Co., Hindustan Construction Company (HCC), Ansals, etc.). Construction usually is done or coordinated by general contractors, who specialize in one type of construction such as residential or commercial building. Cost structure of the construction industry is dominated by raw material cost and subcontracting cost. Raw material cost which is the major cost accounts for 30-50% of the total cost and subcontracting cost accounts for about 20-40%. The raw materials consumed by Construction Industry in any country mainly include cement and steel. The Consumption of steel by construction industry has grown of 16.1% over past 5 years whereas cement consumption has registered of 9.6%. Unprecedented rise in prices of these two raw materials has a direct impact on the cost of the project and in turn margins of construction companies. Profitability also depends upon the diversity of the projects a company can execute. Companies having strong presence in segments like power and industrial segment which are complex to execute, tend to enjoy higher margins. Today Indian sub continent is the second fastest-growing economy in the World. The Indian construction industry has been playing a vital role in overall economic development of the country, growing at over 20% Compound Annual Growth Rate over the past 5 years and contributing ~8% to GDP. LARSEN & TOUBRO ECC - the Engineering Construction & Contracts Division of L&T is India's largest construction organization. Many of the country's prized landmarks - its exquisite buildings, tallest structures, largest industrial projects, longest flyovers, highest viaducts - have been built by ECC. HINDUSTAN CONSTRUCTION COMPANY HCC is distinguished by its boldness of vision and the courage and confidence it displays in taking on the toughest of challenges. HCC operates the construction of technically complex and high value projects across segments such as Transportation, Power, Marine Projects, Oil and Gas Pipeline Constructions, Irrigation and Water Supply, Utilities and Urban Infrastructure. In Transportation, HCC has to its credit more than 300 road and rail bridges, expressways & roads and marine construction. It has built over 100 Environmental Engineering projects. In addition to all this, it has also built some of India's best-known industrial structures. The Indian Construction Industry registered a healthy 33.6% growth in top line during the June 2007 quarter. The aggregate numbers from a sample of 51 construction companies and the industry continued to grapple with high raw material costs which grew by 46% during the quarter. Another challenge which the industry is contending with is retaining skilled manpower. Personnel cost during first quarter grew by a sharp 54%. However a slower 20% rise in other expenses negated the impact of higher raw material and wages cost. As a result of this the operating expenses grew by a slower 31% as compared to sales. The construction sector was thus able to maintain its operating margins at around 12% for the third consecutive quarter. The same is marked a year on year expansion of 162 basis points from 10.3% in June 2006. The construction industry has started to feel the pinch of rising borrowing costs. After a 31.5% rise in the March quarter, interest cost grew by a sharp 45% during the June quarter. However a higher other income cushioned net margins of the sector which healthily expanded year on year from 5.5% to 7.3%. Green buildings in India have gained tremendous momentum during 3 to 4 years, ever since the Green Business Centre embarked on achieving the prestigious LEED rating for their own centre at Hyderabad. The Platinum rating for green building has sensitized the stakeholders of construction industry. There is tremendous potential for construction of green buildings in India. The estimated market potential for green building will be about $ 400 million in 2010. There will be favorable policies and the government would provide the right impetus for advancing the green building movement in India. Indian Construction Industry consists of 200 firms in the corporate sector. In addition to these firms, there are about 1, 20,000 class a contractors registered with various government construction bodies. There are thousands of small contractors, which compete for small jobs or work as sub-contractors of prime or other contractors. Total sales of construction industry have reached Rs. 42885.38 cores in 2004 05 from Rs. 21451.9 cores in 2000-01. Human capital is the most important asset to a construction company. Clearly the success of the construction industry is based on the quality of its people. And this quality of human capital will depend on the possible employment opportunities. Indian Construction Industry of today is continually looking for leaders who want to help shape the world we live in at the highest level. The private sector offers wide employment opportunities, particularly for those trained in architecture and construction/ project management. Large construction houses, multinationals, builders and promoter firms, real estate developers, and construction consultancy firms, also employ professional construction managers. The banking, and housing finance sector, also take in qualified construction managers to handle construction finance and project appraisal activities. Indian Construction Industry is expected to witness effective investment over Rs. 10,000 bn during the 11th five year plan. The Construction is the second largest economic activity in the country next to agriculture. With its various links the Indian Construction industry has generated employment for 33 mn people in the country. In FY 08, Construction sector contributed about 8.5% to the country's GDP. Over past 3 years, construction as a %age of GDP has increased from 8.0% in FY 06 to 8.5% in FY 08. The multiplier factor between growth rates of construction and GDP has been about 1.5X-1.6X. Today India is the second fastest-growing economy in the World. The Indian construction industry has been playing a vital role in overall economic development of the country, growing at over 20% Compound Annual Growth Rate over the past 5 years and contributing ~8% to GDP. India's household income is rising sharply. The new evolution of middle income groups has supported the boom of construction industry. As a result of rising income and swelling middle class, India's per capita income has doubled over the past 20 years. With population growth of about 1.6% per annum and Gross Domestic Product (GDP), growth of 9% per annum, the per capita income is expected to quadruple by the year 2020. 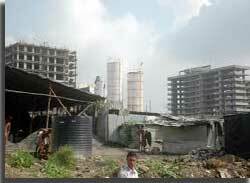 The average real income of urban India and rural India is likely to grow by 5.7% and 3.6% respectively by 2025. Moreover, India's middle class is expected to expand by more than 10 times from its current size of 50 million to 583 million people in next 18 years. Therefore, all these estimates work out to make a strong case for higher home loan GDP ratio so that India and its population is able to keep a pace for meeting the demand for housing units.